The New York Dolls are a protopunk group formed in New York City in 1971. 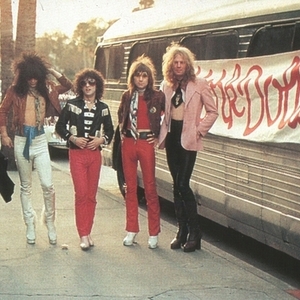 Though they found little success during their initial run, the New York Dolls prefigured much of what was to come in the punk rock era and even later; the Dolls' over-the-top crossdressing influenced the look of many glam metal groups, especially that of early M&ouml;tley Cr&uuml;e, and their shambling, sloppy but highly energetic playing style set the tone for many later rock and roll bands. Chrissie Hynde once commented that every punk band ("And I knew them all") had both New York Dolls albums, illustrating the Dolls' influence. In 2004, the three surviving members reunited for some work. In 2006, now down to two surviving members, the band released a new album, One Day It Will Please Us to Remember Even This. Two albums followed after this, Cause I Sez So in 2009, followed up by a revamped lineup for 2011's Dancing Backward in High Heels.